Milton Friedman, one of the great economists of our time and winner of 1976 Nobel Prize in economics passed away 16 November 2006, at age 94. 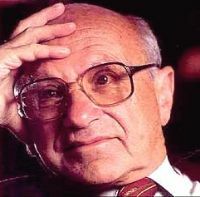 Friedman was widely regarded as the leader of the Chicago School of monetary economics, which believes that fluctuations in the performance of the economy (which the economists call business cycles) are influenced bytinkering with the quantity of money supply in the economy controlled by the country's monetary authorities (Bank of Canada, in case of Canada). This is called monetary policy. Friedman believed that monetary authorities should not be varying money supply to smooth out the fluctuations in the economy or to use it to guide the economy to achieve full employment or price stabilization (controlling inflation). According to him such policies would lead to more instability and fluctuations creating unemployment or inflation or both at the same time called stagflation. He believed and advocated vehemently the money supply should be increasing at a stable rate. Friedman's theory, research and arguments were quite the opposite of the dominant widely accepted and practised theory of John Maynard Keynes, a British economist of 1930s and 1940s fame. It is widely believed that Keynes advice and theory helped a large number of economies including the US and Canadian economies to pull out of the great depression of 1930s. Keynes had advised an active role for the government to steer the economy through the fiscal policy (government spending, tax variations and government borrowing) to try to achieve the full employment goal as well as to control inflation. Friedman challenged the notion, in theory and practice. Friedman seems to have prevailed, as the Keynesian, approach by and large, seems to have retreated from front pages. This, indeed, was quite an achievement on the part of Friedman and he received a great deal of recognition, fame and even the Nobel Prize. Friedman did not subscribe to the idea of government playing an active role in the economy, be that for lowering poverty by directly helping the poors or for providing and controlling education or for that matter any other similar functions. He was a great believer in almost a totally free enterprise private economic system and letting individuals struggling, surviving, investing, building and thus enriching themselves and the economy at the same time. According to Friedman if the free enterprise private economy does well, everyone benefits including the less fortunate members of the society. And the economy does well if the individuals do well and hence leaving the economy's well being to individuals rather to the government. The fact that privatization, market economies, free trade, globalization are so widely accepted today are quite a manifestation of Friedman's influence in the world. Nothing, however, is perfect and he is of course, subject to criticism from the socially more conscientious individuals and groups. His theories though are still well established in economics as well as in practice. Friedman was economic advisor to Barry Goldwater, and to presidents Nixon, Ford and Reagan. He and John Kenneth Galbraith, who also passed away this year, were contemporaries, poles apart on most issues, but friends to the end. Amile Sheikh is a prominent Canadian economist and teacher. He lives in Ottawa.